Best Pizza in Minnesota: Our 10 Favorites! Despite being far away from cities like New York and New Haven, Minnesota is home to some very special pizza of its own. A couple of our local shops have won national acclaim, while others will simply hold a grip on the stomachs of locals forever. Here are the 10 best places to grab a pizza in Minnesota. Based on the sheer number of them on Minnesota highways, you’d think Sven and Ole’s bumper stickers were issued annually with license plate renewals. Grabbing a pie or a slice from this beloved pizza joint in the state’s most scenic town is a rite of passage for Minnesotans and visitors, alike. And the pizza’s is pretty darn good, too. Since this south Minneapolis destination opened, it’s been one of the hardest tables to get. A combination of a no-reservations policy, a small restaurant, and outstanding pizza often has lines out the door in the summertime. Lola, named after the owner’s dog, is also known as one of the most kid-friendly restaurants in the Cities, so bring the whole family. Once just a small joint in St. Paul’s Highland neighborhood, trying to keep its 800-degree, wood-burning ovens fired up to meet the demand, Punch is now a local chain with locations across the Metro. Amazingly, the quality remains consistent, and it often makes national “best pizza” lists. It’s thin, Neapolitan-style crusts and tangy sauces make it Punch pizza pretty much irresistible. Black Sheep’s coal ovens lend a distinct, smoky flavor and a serious crisp to the crusts of its pizzas. No best of list in the Twin Cities has failed to include Black Sheep since it opened its first location in the North Loop. Demand for its delicious pies necessitated new locations in St. Paul and on East Street in Minneapolis. Founded in Hibbing after a World War II tour of duty in Italy and a trip to Chicago, Sammy’s now has more than a dozen locations in Minnesota and Wisconsin. Each one is owned by a member of Sam Perella’s family and maintain the quality of the original—Sammy’s is often named Duluth’s best pizza—but there’s something about the history and nostalgia of the Hibbing location that makes it just a little tastier than the others. So, we’re cheating a little bit with this one. Pizza Lucé was founded in Minneapolis, but now has a handful of Metro locations, as well as its Duluth outpost. Thus, we’re not pointing back to the original location—but for a reason. The Duluth Lucé location is different. Not only does it offer up the same award-winning pizza that is perennially the “Best of” something, it’s also one of the city’s best live music venues. Its downtown location is within easy walking (and delivery!) distance of both Fitger’s and Canal Park. This no-nonsense South Minneapolis fixture is exactly what you’d want in a decades-old, neighborhood pizza joint on the edge of Uptown: Spicy, cheesy, delicious pizza in a place with lumpy booths, bright lights, and late hours. Leaning Tower has been on its Lyndale Ave. corner for so long that many Minneapolis residents have had both their first and last bites of pizza in the place. Despite its recent overhaul—including the addition of a fancy upstairs restaurant, Louis— Cossetta’s is a W. 7th St. institution that continues to serve up slices bigger than your face and pies the size of manhole covers. The classic New York-style pizza comes in the same three or four flavors of slices as it always has, cheese, sausage, etc., but you can customize your own pie for dine in or takeout and feed your family for a week. 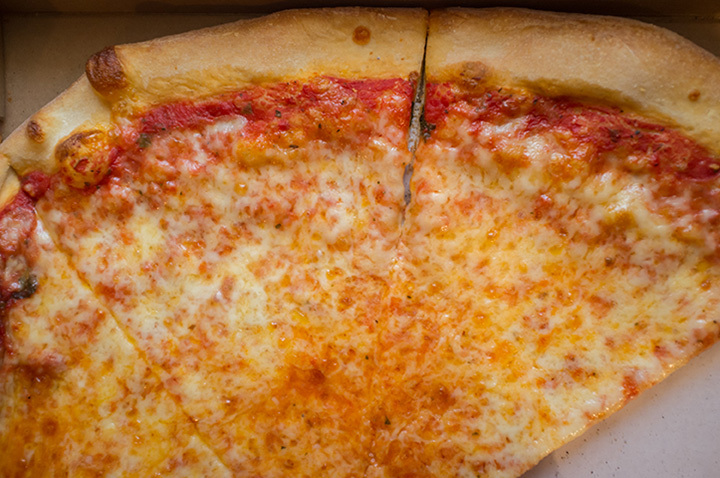 Order by the slice or by the pie; either way, you won’t disappointed (you may go back for more, but you won’t be disappointed) in Pasquale’s New York-style pizza. Rich sauces, fresh ingredients and crisply-finished crusts keep folks coming back, only to run into friends, family members, and other people from the neighborhood, trying to sneak in one last slice for the day. This one is a nostalgia entry-but no one is going to argue about how good Pagliai’s Pizza is. They opened the Mankato location in 1969 and it is now the city’s oldest pizzeria. Why? Because, as other places come and go, Pagliai’s retains its rigid adherence to cleanliness, fresh, never-frozen ingredients, and classic recipes that leave adult minds longing for the pizza of the their youths. It may not be the best pizza in Minnesota, but it’s the best pizza in the world, ever.